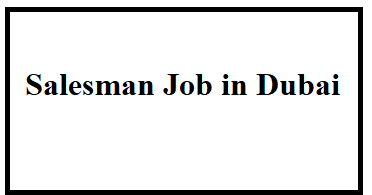 Salesman Job in Dubai: If You Find job of Salesman Job. Then You came at right place Because Here We provide best available job of Salesman Job in Dubai. Please read whole article proper and check requirement, eligibility, skill. If you have match all these criteria then apply for this job as mention below. • Opening up new markets and dealing with new customers and customers from all areas. • Provide excellent product information. • Negotiation of product prices and profit margins to our customers. • Mediation of delivery of products to our customers. • Arrange and participate products from our warehouse to our customer warehouses or final delivery locations. • Update the sales records, dealers and customers daily. • Follow-up calls to ensure customer satisfaction. • Reporting all sales activities and results to Sales Managers. • Valid UAE driver's license. • If English can speak, Hindi and Arabic would be an added advantage. • Knowledge of the streets of the United Arab Emirates. Only Pakistani / Indian Muslim candidates with the above skills and qualifications with proven experience can apply to your last CV at our email address HR.UAE@wareen.com.